One of the most beautiful creatures to grace the earth is the butterfly. The sight of a butterfly flying in the air during the spring or summertime in its sheer beauty and gracefulness is awe-inspiring. 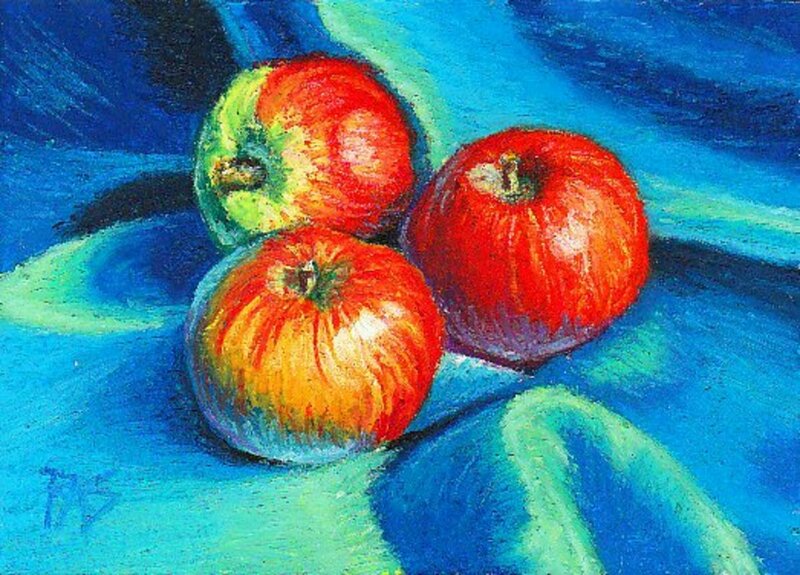 Its natural beauty has also inspired many an artist over the centuries. One country the butterfly calls home is Japan. To the Japanese people, the butterfly has many meanings. It has a spiritual meaning, a symbolic meaning, and an artistic meaning. In this hub you'll find an overview of the meaning and significance of the butterfly to the Japanese people, the reflection of these meanings in Japanese artwork, the butterfly and its significance to the samurai, some of the famous artists to depict the butterfly in their artwork, and the butterfly in modern-day Japanese media. I hope you enjoy! What is the Meaning of the Butterfly in Japanese Society? In Japan, the butterfly has a whole plethora of meanings to the Japanese people. Before trying to understand Japanese butterfly art, these meanings and purposes must be understood. First off, the butterfly has a spiritual significance to the Japanese people. Since caterpillars transform into butterflies and go through the cycle of birth, transformation, and death, many Japanese traditionally believe that the butterfly carries the souls of the dead or represent the souls of the dead. Also, many Japanese believe that following a butterfly will help unlock a mystery in life or solve a problem driving a person crazy. Secondly, the butterfly is considered by the Japanese to be a symbol. A symbol of girls in love and a symbol of girls transforming into graceful young ladies, as well as of young womanhood in general. Butterflies are also symbols of springtime and happy marriages. Butterflies often represent starry-eyed lovers in Japanese poetry, and often as two tragic lovers whose souls have transformed into butterflies after having committed suicide together. Finally, butterflies are popular in Japan for artistic purposes. Butterflies can be found in motifs on kimonos, yukata, and other clothing (both traditional and non-traditional), on family crests (known as 'kamon' in Japanese), in paintings and ukiyo-e woodblock prints, on pottery, and elsewhere. The butterfly was highly symbolic to the medieval-era Japanese clans and the samurai who served them. For many centuries, powerful Japanese families have often chosen the butterfly to be the insect of choice on their family crests, known as 'kamon' (家紋) in Japanese. Butterfly crests are known as 'Chō mon' and have been around for thousands of years. 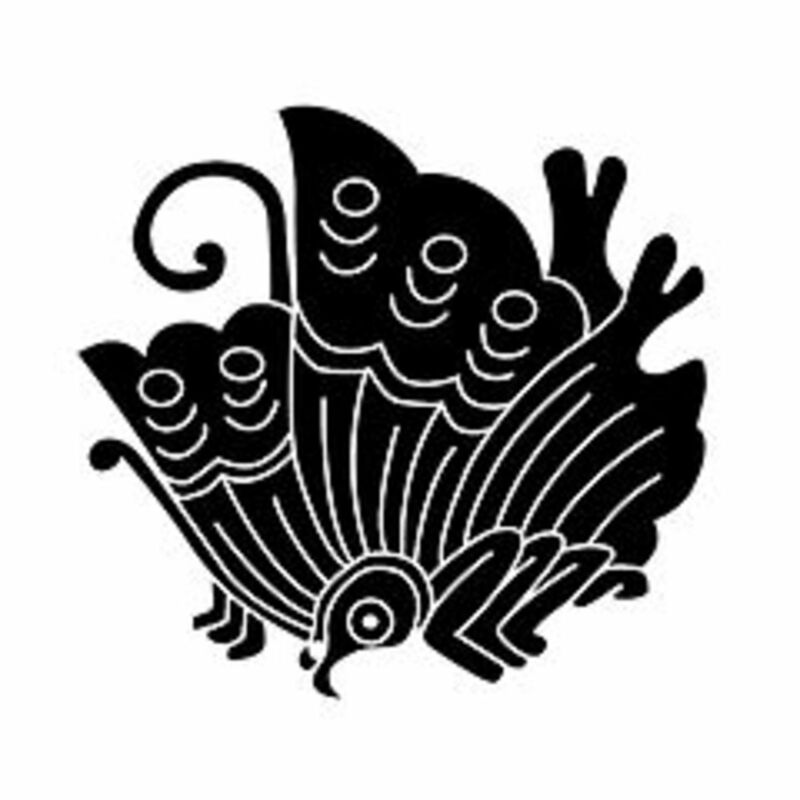 One of the first clans to use the butterfly on their family crest was the Taira clan. This clan was one of the most powerful clans in Heian era Japan (794-1185) and was one of the first and most powerful samurai clans. They wore the family crest proudly on their armor, jewelry, and more. In addition, the samurai often decorated their armor, flags, banners, and weaponry. They did this not only as a sign of clan loyalty, but also to identify themselves in battle. Since butterflies are a traditional symbol of womanhood and romance, it's only natural that butterfly motifs have appeared on the clothing worn by Japanese women and girls over the years. Butterflies are a common motif on women's kimonos and yukata (a short, thin silk summertime kimono) and have been for many centuries. And of course, there's the butterfly knot, which is a knot used by women for tying women's kimono sashes (called an 帯, or 'obi')! To this day butterflies can still be found on women's t-shirts, purses, jewelry, and more. The butterfly is a very popular subject for origami. In fact, the earliest known reference about origami is from a poem written by Japanese poet Ihara Saikaku in 1680 which describes a dream about paper butterflies! It was from this poem that the tradition of Mecho and Ocho were born. Mecho and Ocho ('mecho' meaning 'female' and 'ocho' meaning 'male' in Japanese) are two origami butterflies that are placed on sake bottles during a Japanese wedding ceremony. In the poem, Ihara describes the two butterflies in his dream as Mecho and Ocho and hence the names! Butterflies have been made since origami came into existence during the 1600s and are now being made by origami enthusiasts all around the world! The butterfly has been a popular subject for Japanese artists throughout the history of Japanese art. There are many drawings and paintings of butterflies dating back well over a thousand years. Butterflies can be found on silk screens, paintings, fans, and more. 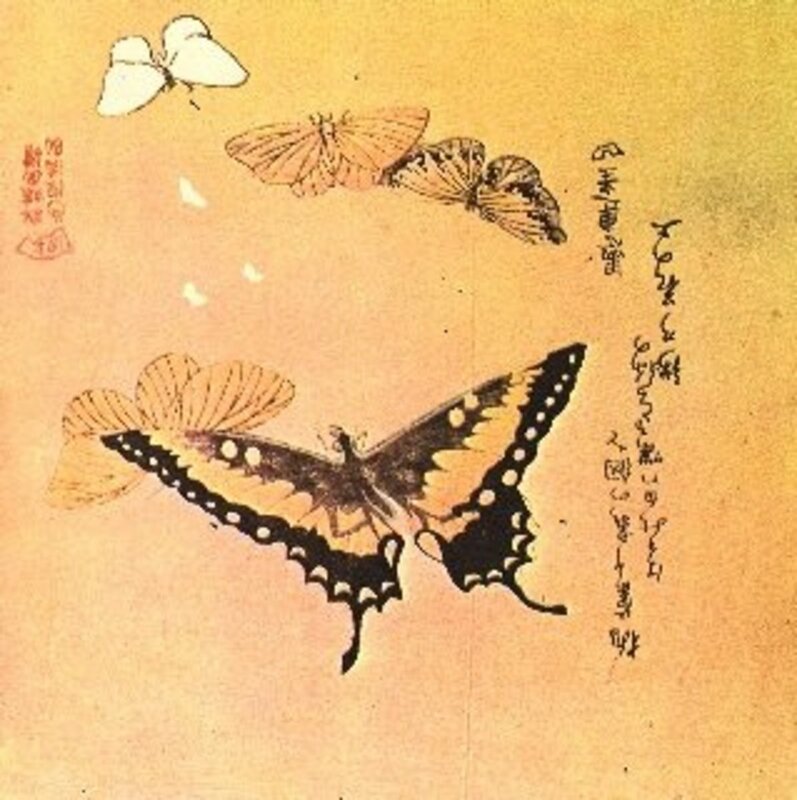 Traditional paintings of butterflies were made by artists such as Maruyama Okyo (1733-1795), who was the founder of the Maruyama school of arts. When the era of ukiyo-e woodblock cuts came along during the Edo period, the butterfly quickly became a popular subject for the ukiyo-e artists. One of the most well-known butterfly ukiyo-e prints is Katshshika Hokusai's print "Peonies and Butterfly". One of the admirers of this print happened to be Claude Monet, who hung a copy of this print in his Giverny home along with over 200 prints! Ukiyo-e butterflies were also made by Utagawa (Ando) Hiroshige, Kudo Shunman, Yanagawa Shiganobu, Totoya Hokkei, Utagawa Toyokuni, Yanagawa Shigenobu, Kitao Masayoshi, and Shirobe Fujie. When ukiyo-e's popularity waned during the Meiji period (1868-1912), Western-style paintings and photography surged in popularity. 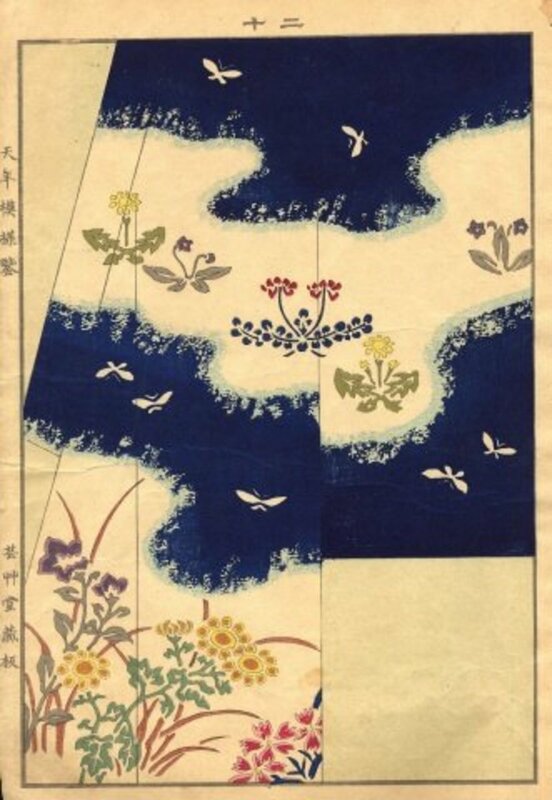 Artists such as Ikegami Shuho painted the butterfly, as did Saburo Hasegawa later on during the Showa period (1926-1989) in his 1937 painting "Locus of a Butterfly". In modern times, butterflies are very common in Japanese anime and manga. Most often, butterflies represent a character's fleeting thoughts or dreams. In the famed anime series "Sailor Moon", the butterfly is the symbol of Princess Kakyuu in the fifth season of the series. In "Bleach", butterflies take on a somewhat traditional role and help guide souls to the next world as well as help shimigami communicate with each other. Also, in the series "Kuroshetsuji II", a blue butterfly appears at the beginning of the first episode and is the prey of a spider. At the end, a swarm of butterflies appears and one transforms into a person. In the manga series "Little Butterfly", the butterfly is a symbol of freedom for the high school students Kojima and Nakahara, who fall in love and want to run away and be together. Of course, there's also the theme song to the Digimon series, which is titled "Butter-Fly"! 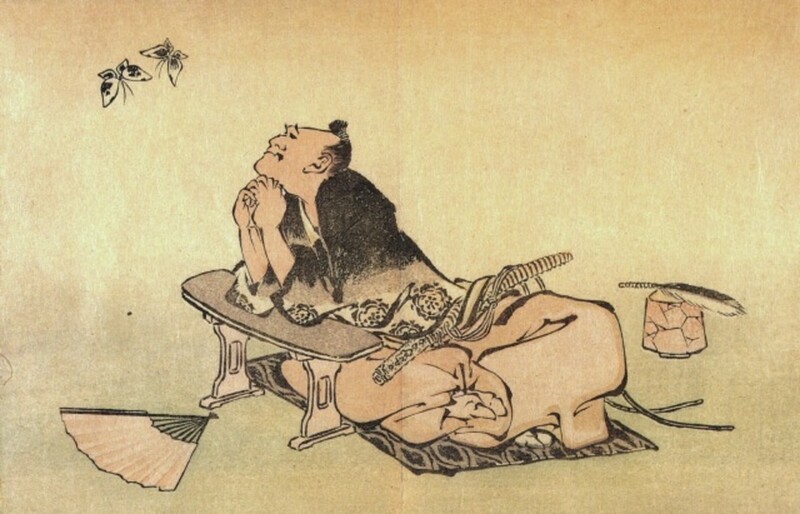 Anime and manga have picked up where the ukiyo-e artists of old have left off, and the butterfly is as much a popular subject and symbol in both as it was over 125 years ago for the ukiyo-e artists! Japanese-style butterflies have been a very popular tattoo design among women in both Japan and elsewhere in the world, largely due to the Japanese butterfly being symbolic of feminine grace and young womanhood. In Japan, there is a stigma surrounding tattoos. For the most part, this stigma was largely born from a law that was in effect from the 17th century when the Edo shogunate officially banned tattooing. This ban was only lifted in 1945 after the end of World War II. Also, the Japanese people tend to associate tattoos with the Yakuza, who started wearing these tattoos in the Edo period when they were officially banned. More and more young people have been getting tattoos in recent decades, but the stigma still exists. There have been many stunning butterfly designs made by world-renowned tattoo artists and the butterfly will surely adorn the bodies of many people for many more years to come! The butterfly has never lost its meanings to the Japanese people over the centuries, nor has it lost its natural beauty and grace. There's no doubt that all of these qualities will make the butterfly a popular subject for artists, Japanese and foreign alike, for many more centuries to come. Thank you for visiting this hub and please check in again as I will make more updates over time! Interested in butterflies from Japan? Marvel in the history of the beautiful culture of Japanese butterfly art. Wikipedia entry about the Chinese philosopher Zhuangzi, which includes a section about his famous butterfly dream. I agree with truefaith7 that you are an inspiration! I love butterflies, and the information you provided here is priceless. I love Japanese art, especially the butterflies. Great content! Thoroughly enjoyed your hub about butterflies. Recently I went to my art supply store, the salesman asked me if I am an artist, I told him that I do like to paint. Right that moment the Filipino looking boy asked me if I can paint a butterfly for him. He said I will pay you. I did agree to paint, not for the money but for the fun of it. I have to do a butterfly for him, I have a canvas placed on my aisle but needed an inspiration to start. You hub has given me so many sparks to ignite my strokes on a butterfly. Hello again. I have just reread your beautiful hub. I enjoy your work. Very nice article. The butterfly is a symbol of new life. You're most welcome for the info. That much is true! Butterflies are something that most Westerners don't normally associate with medieval armor or battle flags/banners. It is very, very fascinating how butterflies are perceived in Japan compared to the way(s) most Westerners perceive them. It's always interesting to find out how different cultures think about the same thing, in this case about butterflies. I can't imagine medieval knight with a butterfly on his shield, but it totally makes sense with samurai. Thanks for all the fascinating info. No problem Mathias, and glad this hub answered your question! Thank you HouseBuyersUS! I appreciate the feedback greatly! Glad you enjoyed your visit Maralexa, and you are very welcome! Another beautiful hub. Well done and so interesting. Thanks so much for your excellent work. Thank you! Glad you enjoyed this hub! A very good hub..very interesting and informative! Thank you so much! I'm glad you found this hub useful and informative! Butterflies are amazing and it never ceases to amaze me how something so beautiful and artistically intricate can come from a caterpillar. I will try to add more to this hub over time and with any luck, it will keep on being informative! I'm always impressed and fascinated by butterflies. As a graphic artist I love to draw butterflies whenever an opportunity comes. This article is an awesome one in the sense that it covers each and every aspect of butterflies from the aesthetic point of view. Thank you for sharing many unknown facts about the wonderful creature in Japanese tradition and culture. Voted up! Awesome! Thank you for your visit. I really like that print too and thought it worked out pretty nicely on this hub! Very good point about butterflies in Western culture. They can be as meaningful in the West as they are in Japan and Asia. I like the print you used to illustrate your hub. Butterflies are significant in western culture too. They symbolize the beautiful but temporary nature of life. Thank you! Awwwww...sorry that you are scared of butterflies, but I'm glad you still liked the hub and found it informative anyway! A very interesting and informative article. I am terrified of moths and butterflies, but can understand how some people think of them as beautiful creatures. Well written and I have voted up and interesting.